Home About Ramadaan Month of Fasting or Month of Feasting? Month of Fasting or Month of Feasting? The holy month of Ramadaan is a time of restraint, reflection, and renewal. Muslims make every effort to better themselves and to be drawn closer to their Creator. They guard their tongues, engage in long hours of worship, exercise patience, and open up their hearts and pockets to charitable causes. However, when it comes to consuming food during the evening hours, some believers fall short of following the Sunnah of Prophet Muhammad, peace and blessing be upon him (pbuh). In order to compare the eating habits of Muslims today, during the month of Ramadaan, with that of Prophet Muhammad (pbuh) an informal survey was conducted. Over 270 participants from around the world were asked about their consumption habits during this sacred month. Sixty percent of participants were from the US, 20% from the Middle East, 10% from South Asia (Indian Subcontinent) and 10% were from other countries. Regarding the iftar meal, it is encouraged to break your fast as soon as it is permissible to do so. The Prophet (pbuh) would hasten to break his fast. Sahl ibn Sa`d reported that the Prophet (pbuh) said: “The people will not cease to be upon good as long as they hasten in breaking the fast.” (Bukhari and Muslim). After this process the body is ready to accept and digest additional food. Thus ideally, one should break their fast with a date and after praying the Maghrib prayer, they should continue with their meal. This gives the body ample time to prepare itself for the sudden increase in food intake. Fifty eight percent of respondents to the survey stated that they eat their meal after the Maghrib prayer. Thirty four percent of respondents include desserts in their iftar meal. It is during the Iftar meal that we consume the most and often overindulge ourselves. Forty percent of participants admitted that they eat at least twice as much for Iftar than they eat for a regular dinner in any other month. Fifty percent of respondents to the survey admitted that they over eat during Ramadaan and 62% felt that they eat heavier and richer foods during this blessed month. Thus, it is a cause for concern that especially in this holy month of Ramadaan, when the nafs (self) should be kept in check, some choose to overindulge and eat in extravagance. Fasting during the daylight hours has several health benefits; it cleanses the system and removes harmful toxins from the body. When the body is fasting and not occupied with the process of digestion, its organs are given an opportunity to rejuvenate and restore themselves, in turn allowing the one who fasts to recover from various ailments. However, if a person overeats in the evening and indulges in heavy, fatty foods, this offsets the physical benefits of fasting. 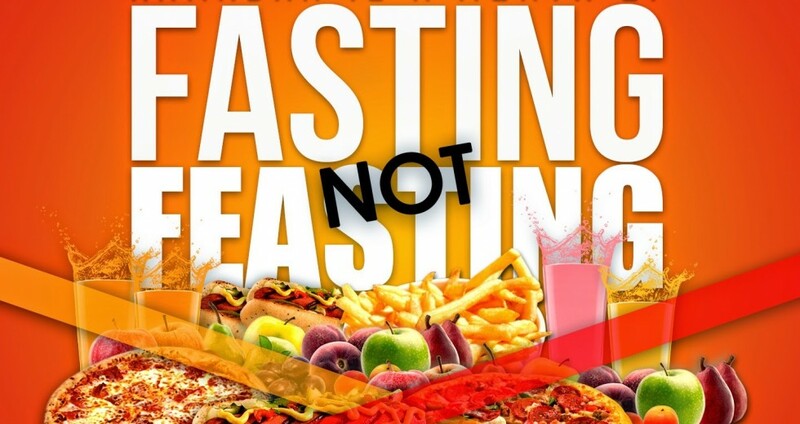 It is generally presumed that since one is restraining from food and drink during the daylights hours, the body needs increased input during the non-fasting hours. This is not the case, however, as the body regulates itself when it is in fasting mode and has the opportunity to utilize its storage of body fat. To remain healthy and active during Ramadaan, the amount of food intake is not as important as the variety of foods we eat. The Prophet (pbuh) was known to eat an assortment of foods including meat, fruit, bread, and dates, according to Imam Ibn Qayyiim. Thus to maximize the physical benefits of fasting it is desirable to eat less but have a balanced diet which taps into the major food groups. As for the types of foods eaten during Ramadaan, 67% of respondents said they eat 3 or more different types of dishes, with the over 30 year olds eating more of a variety of foods than the 18 – 30 year olds. Fifty seven percent of the participants stated that they eat fried food for iftar and 34% of them said that the majority of their meal consists of this type of food. Thirty four percent of respondents include desserts in their iftar meal. Dates are a power house of nutrients and an instant source of energy; they are high in sugar, fiber, iron, potassium and magnesium. Consuming dates allows one to feel satiated for an extended period of time, making it a perfect food to start your fast with. Forty nine percent of the respondents said they have tea or coffee for Suhoor, this is not a wise option as caffeine is a diuretic which does not provide us with sufficient hydration and causes us to lose liquids along with essential minerals from our body. Sixty one percent of respondents who are over 30 drink tea or coffee in the morning and 42% of respondents younger than 30 drink tea or coffee. Ramadaan is an excellent opportunity to rid ourselves of addictions to caffeinated drinks. One should drink plenty of water and pure fruit juices instead. The Prophet (pbuh) warned against submitting to our desires when he said, “My greatest fear for you is the appetites of transgression with regard to your stomachs and your privates and the inclinations which lead astray.”(Ahmad) Thus we should eat only that which is beneficial and only enough to sustain us and give us the strength to carry out acts of worship and obedience. Ramadaan is an opportunity to reevaluate one’s relationship with food. It allows one to realize that they can get by without eating for several hours and that their bodies are capable of functioning on a moderate amount of consumption. Ramadaan is fast approaching so instead of spending the coming weeks stocking the pantry and freezer with delights to feast on when the sun sets, let us focus our attention on perfecting our ibadah (worship) so that we may savor the bountiful treats of Jannah (Heaven) without having to worry about clogged arteries or accumulating extra pounds! El Ati, J., C. Beji and J. Danguir. “Increased Fat Oxidation during Ramadaan Fasting in Healthy Women: an Adaptive Mechanism for Body-weight Maintenance.” American Journal of Clinical Nutrition. 62: 302-307, 1995. Filed in: About Ramadaan Tags: Month of Fasting or Month of Feasting?